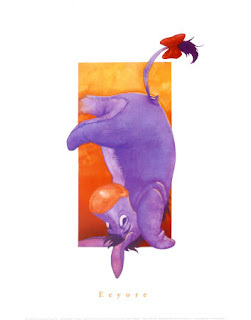 It has been no secret around this blog that I have been a little off lately - in a funk, feeling bad, basically just walking around with a giant Eeyore cloud. Now, do not get me wrong. For all intents and purposes I am fine - I just have a lot on my mind. And while I was expressing all of this mind-stuff to a friend Tuesday night she offered some sage advice: "Meditate or Medicate." This was said in jest, but it was like a slap to the head. I hadn't practiced yoga in a week! A Week!! Its no wonder I felt drained...I needed time on my mat. Needless to say, I dragged myself to Power Yoga at Revelation last night...and I do mean dragged. This lack of energy thing is killing me. 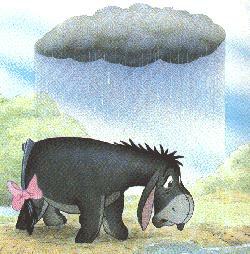 But once I walked through the door, it was like my Eeyore cloud had lifted. At the start of class, Kim asked us to really feel what our intention was, not to think about it. The only thought or feeling that came to me was to breathe. My intention was to breathe slow and deep and to focus on that breathe. We ended up having a medium hard class and I was able to really focus on my breathing and the result was a calmer mind and a better mood! In fact, last night I slept better than I have in days and I woke up this morning in a great mood. I'm so glad to be practicing again, I may even put myself through the torture that is Internal Muscle Shift class tonight. It is really easy sometimes to forget the habits that make us happy...I'm just glad someone reminded me of mine!